Many books about bears are available from the visitor centers. Enter bear country with respect and humility. You are not the dominant species in Alaska's backcountry. Fear of bears is quite reasonable, although many bear stories are greatly exaggerated. The chances of being injured on your trip "TO" Alaska are far greater than being injured by a bear here. However, if the fear of traveling in bear country is overpowering perhaps it is best that you travel on trails where there is little chance of encountering a bear. Ask at a ranger station or visitor center for their recommendations. 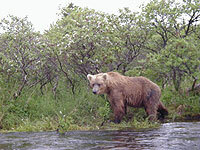 There are numerous trails to visit in the Cordova, Alaska ecosystem. You have the luxury of choosing where to travel; the grizzly, due to habitat, does not. A bear's reaction to you can be influenced by many factors and is never entirely predictable. Simply put, some bears are more dangerous and aggressive than others. Any bear that has become accustomed to people and shows no fear of them is a dangerous bear. Remember that bears are wild and unpredictable. THERE IS NO GUARANTEE OF YOUR SAFETY. 1. Surprising a bear (make noise). 2. Getting between a sow bear and her cubs. 3. Getting too close to a carcass or a bear with food. The chances of being attacked by a bear can be reduced considerably by avoiding the above situations and taking the following precautions. Watch for tracks, droppings, diggings or other bear sign. Rest often when you are tired. Carry binoculars and scan ahead periodically. Fleeing wildlife may be an indication of bears in the area. If you see a bear cub, you can expect the mother to be close by. Beside the dark limiting your vision, bears travel (often on the trails) and feed mainly at night. For this reason it is wise to plan you itinerary carefully so that you will not travel at night. Large parties are safer than solo hikers. Groups tend to make more noise and appear more formidable to a bear. Also, if there is an attack, there are enough members in the group to render assistance to the injured while others go for help. However, having a larger group is no reason not to pay attention to your surroundings. As a general rule, the noisier the safer. Make a variety of noises; talk, clap hands, shake pebbles in a can, to let a bear know of your presence. Don't rely on bear bells; oftentimes they are too quiet. Whistling is not recommended as if may inadvertently imitate another animal, drawing the bear to you. Yell every few minutes to alert bears, especially when traveling upwind, near streams or in thick brush. Keep in mind that noise is disruptive to nearly all animals in backcountry. There is a good chance of not seeing any wildlife when you are making noise to avoid bears. Understanding and accept the trade off. Report any dead animals near a trail or campsite to the nearest ranger station. Never camp in a campsite hat has a carcass nearby. Concentrations of ravens and/or coyotes may be an indication of a carcass. If you smell rotting meat, stop hiking. It is very risky to approach a dead elk, bison or any other animal carcass. A bear may be out of sight guarding its food. Leave bacon, tuna, ham, scented deodorants and other odorous items behind. A bear's acute sense of smell can detect aromatic odors for great distances. Dry foods are lighter to carry and not as aromatic. KEEP OUT OF SIGHT AND DETOUR AS FAR AWAY AS POSSIBLE. If the bear does not see you, avoid the bear by keeping out of sight and detouring as far away as possible behind the bear and downwind if you can. If the bear sees you, expect it to either run away, circle down wind to get your scent, or come closer for a better look at you. Bears do not charge on their hind legs. You should climb a tree or slowly walk up wind if possible, so the bear can get your scent. Don't even think about moving in for a close up photo. DO NOT RUN. DO NOT MAKE SUDDEN MOVEMENTS. BACK AWAY SLOWLY, DROPPING GEAR OR CLOTHING IF POSSIBLE. TALK QUIETLY TO THE BEAR. Act non-threatening. Do not shout or make sudden movements which may excite the bear. Avoid looking directly at the bear. If the bear turns sideways to you, pops its teeth together, or makes a series of "woofs", it is warning you. Bears may also engage in other displays intended to scare off the threat such as huffing, panting or growling, looking directly at you, or slapping one or both feet on the ground. Move your arms up and down slowly as your sides. Retreat slowly backwards. DON'T RUN. Talk slowly and quietly to the bear. Look for cubs. Be prepared for a charge. Tree climbing to avoid bears is popular advice. but not very practical in many settings. All black bears, all grizzly cubs and some adult grizzlies can climb trees if the spacing of the branches is right. Running to a tree may provoke an otherwise uncertain bear to chase you. YOU CANNOT OUTRUN A BEAR! Bears can run up to 40 mph over short distances. If you do climb a tree, make sure you pick a good one and climb at least 15 feet up. MANY CHARGES ARE BLUFF CHARGES. HOLD YOUR GROUND, NEVER RUN. IF THE BEAR DOES NOT STOP, PLAY DEAD. If the bear charges you, freeze. Some bears will bluff their way out of a threatening situation by charging, then veering off or stopping abruptly at the last second. If the bear does not stop, play dead. Drop to the ground, lift your legs up to your chest and clasp your hands over the back of your neck. Wearing your pack will shield your body. Bears have been known to inflict minor injuries under these circumstances. It takes courage to lie still, but resistance would be useless. Keep silent and still. Look around cautiously and be sure the bear is gone before moving. THE BEAR IS BEING PREDATORY. BE AGGRESSIVE AND DEFEND YOURSELF, DO NOT PLAY DEAD. Bears have attacked at night when a person was in a tent or sleeping bag. Night attacks are the rarest form of bear encounters, but unfortunately get all the media attention when they do occur. There are documented cases in North America of black and grizzly bears preying on humans. In these situations, the bear has approached slowly, sniffing and circling, actually stalking its prey. If this happens, it is best to fight back aggressively and let the bear know that you are not prey. The theory behind this is that if you act like prey you may become prey. If it is too much trouble to get the "prey", the bear will give up. Do not lie still in your sleeping bag in these situations. Plan with others in your party as to what you would do should this type of situation arise. Leaving food out where bears can get to it is just as illegal and unwise as feeding bears deliberately. Bears that get food and/or garbage from people usually end up as dead bears. Here's an example of how it happens: Careless campers leave their frozen chicken out to thaw on a stump while they go out on a day hike. A bear passes through the area, picks up the scent and walks into the campsite to investigate. Not only does the bear get the chicken but also ravages through the fire pit and packs for more food. The bear has made the association that people can be a food source. The bear comes back, not only to that campsite, but to others as well on its never ending search for food. The bear gets food rewards, either intentionally or unintentionally. It becomes bolder and walks into campsites while people are there - day or night. One camper tries to grab a food sack from the bear and gets mauled. Bear management personnel trap and then relocate the bear 50 miles away in another part of Yellowstone. The bear returns a day later, driven by its search for food and knowledge that food can be obtained at that campsite. Since the bear has been rewarded in the past it will continue to check other campsites for food. If the bear has cubs, the problem is intensified as the mother will teach her cubs how to get human foods and trash. If the bear wanders outside the park, it stands a chance of getting shot; where it is legal to shoot a bear to protect life or property. A bear that is food conditioned has developed this unnatural behavior through the carelessness of people. A food conditioned bear is more likely to injure or kill people. And if the food conditioned bear injures someone, it is often necessary to destroy the bear. This chain of events illustrates how improper food storage, something that may seem trivial to the uninformed, can lead to the death of a bear. FOOD ITEMS MUST BE HUNG TEN (10) FEET UP FROM THE GROUND AND FOUR (4) FEET OUT FROM TREE TRUNKS. If you are out for the day - hiking, fishing, riding or boating - your food must be stored as if you were hanging it for the night. Cooling beverages in the creek or lake is fine if you are in camp - otherwise they must be properly stored. Use food poles where provided. Don't sleep in the same clothes worn while cooking. Never store food or eat in your tent. Keep your sleeping area at least 100 yards from your cooking/food storage area. Bring at least 50 feet of rope to hang food. Line your pack or panniers with plastic garbage bags. Don't bring large containers such as ice chests unless you're prepared to hang them. Considering bears' highly developed sense of smell, it may seem logical to assume that they could be attracted to menstruating women. Yet studies on this subject are few and inconclusive. If a woman chooses to go into the backcountry during menstruation, a basic precaution should be to wear tampons, not external pads. Used tampons should either be burned in a hot fire until completely incinerated or double bagged in a zip-lock type bag and stored as trash, then carried out. BEAR REPELLENT SPRAYS: DO THEY WORK? The current limitations of all chemical repellents are the incomplete nature of their testing, their short range, the difficulty of accurate delivery if the person is excited, and their potential for abuse and over confidence. 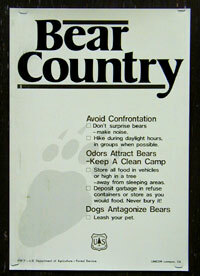 Chemical repellents are no substitute for avoiding bear confrontations and proper precautions. Because of the limited research and information available, chemicals sprays are not recommended.